Sarah Outen biked, kayaked and rowed her way around the world. Image courtesy Justine Curgenven. From wakeboarding through hurricanes to swimming the Antarctic in a pair of Speedos, there’s no denying the human body is capable of amazing feats. However, British adventurer Sarah Outen may have just completed the most astonishing yet. For the past four and a half years Outen, who was awarded an MBE in 2011 after rowing solo across the Indian Ocean, has been making her way around the world by bike, boat and kayak to raise money for charity as part of the London2London campaign. Originally supposed to take two and a half years, Outen covered over 25,000 miles, overcame huge obstacles and even got engaged in the process. 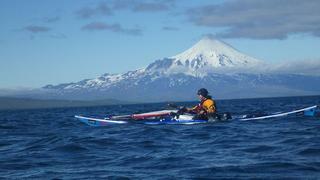 Setting out from London to Calais by kayak in 2011, Outen covered 11,000 miles by bike and kayak across Europe and Asia. She then spent the winter in Japan preparing for the next leg before heading out to row across the Pacific. However, 26 days into her row disaster struck and she was forced to abandon her boat and be rescued by the Japanese coastguard during Typhoon Mawar. Undeterred, Outen returned to Japan in the spring of 2013 and once again set off across the Pacific, this time successfully reaching Alaska, USA making her the first woman to have rowed west to east across the Mid Pacific. It was halfway through this stage that Outen asked her girlfriend to marry her and was spurred on by a resounding 'yes'. After a brief training stint, Outen got back in her kayak with paddling partner Justine Curgenven and the pair made the 1,500 mile journey north to Homer. From there Outen took to her bike – nicknamed Hercules – and spent seven months cycling from the Pacific to Atlantic coasts through one of the coldest winters the USA has ever seen. After enduring sustained temperatures of up to -40 degrees Celsius, Outen finally reached Cape Cod, Massachusetts in early 2015. After all these trials the largest and final hurdle remained: a 3,000 nautical mile row from America’s east coast back to the UK. Despite some unforeseen dangers thanks to Hurricane Joaquin, Outen made it back to Falmouth, UK and finally made her way to London by bike and kayak where she enjoyed a much-needed reunion with family and friends at Tower Bridge.